Based on the book that the New York Times called "powerful" and that the Stanford Social Innovation Review said, "deserves to become the nonprofits sector’s new manifesto." 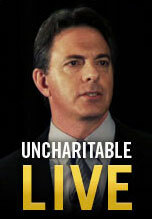 This is Dan Pallotta’s live presentation of the game-changing ideas in "Uncharitable." It’s been delivered to rave reviews at Harvard, Stanford, The Gates Foundation, and to over a hundred audiences from Mexico City to New York to London. Who’s it for? CEOs that know they could change the world if they could enlighten their boards. Nonprofit staff that are stretched, burned out, and tired of working under a system that fundamentally obstructs them. And board members and donors who want to change the direction of their organizations.